U.S. Navy Sailors assist with the onload of the X-47B Unmanned Combat Air System (UCAS) demonstrator aboard the aircraft carrier USS Harry S. Truman on Nov. 26, 2012. A robotic drone the size of a fighter jet has deployed aboard a U.S. Navy aircraft carrier for the first time in history. The Navy's X-47B robot warplane is leading a revolution in robotic warfare that could replace many of the U.S. military's manned aircraft in coming decades. The aircraft carrier USS Harry S. Truman took the drone aboard on Nov. 26 to prepare for its first flight tests at sea — a crucial step toward ensuring that robotic aircraft can take off and land as part of normal carrier operations. "We've been testing the aircraft for the last several years and to finally put it on a ship is so exciting," said Cmdr. Kevin Watkins, flight test director for the Navy Unmanned Combat Air System program. "If these tests are successful, they will prove that the future for unmanned aircraft is wide open." The U.S. Navy's X-47B drone is hoisted aboard the aircraft carrier USS Harry S. Truman in preparation for flight testing at sea. X-47B has a stealthy "flying wing" shape resembling a flying saucer from the side and a wingspan of more than 62 feet (19 meters) — wider than that of the F/A-18 Super Hornet fighter jets that commonly operate from U.S. Navy carriers. "It means a lot to our crew to be part of naval history," said Lt. Cmdr. Larry Tarver, aircraft handling officer on the USS Harry S. Truman. 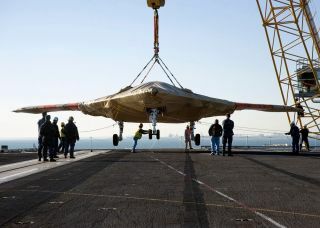 "We have sailors who received additional training to safely move the X-47B and they are excited to play a part in its testing." Past flight tests for the X-47B include taking off and landing from a Navy air base and testing the drone's software "brains" that would allow it to conduct midair refueling on its own. The drone is also expected to have the ability to take off and land from a carrier without direct human control. Still, a human drone operator would still stand by even if he or she is not controlling the drone directly. The operator also has an arm-worn joystick controller that can guide the X-47B drone as it taxis on the deck of an aircraft carrier. No weapon testing has taken place with the X-47B so far. But the Navy undoubtedly wants a fighter-size drone that could one day carry either guns or missiles with a license to kill.